When I was a child, way back when, in the good old days, once upon a time… we did not get to eat a lot of sugar. It was not that our parents—our dear mothers and occasionally sympathetic fathers—did not want us to have sugar. In fact, there was an idea that eating sugar made a child sweet (and there could be a scientific explanation for that old mom’s tale). It was simply that life was hard, people still remembered the Great Depression and we were not a culture of excess… yet. What one had was good enough. Treats—and sugar always translated to a treat—were rare, special, and memorable. I still have a straight scar on my right leg just below the knee, about two inches long, garnered on an early sugar search. I had decided to climb up to get at a slab of leftover cake carefully stored away from children’s reach on the top shelf in the kitchen. In order to accomplish this theft (I knew it was very, very bad even as I plotted and executed my plan, coinciding with when my mother was outside hanging up the freshly washed laundry), I had to climb on a chair, then onto a brass towel rack, and then, I was sure I would be at the right level to encounter the cake (yellow, with chocolate icing, and, of course, homemade by Mother, who was an excellent cook). What I did not factor in was the weakness of the towel rack. As soon my sturdy little body got purchase, the rack gave way, and one of the nails holding it in place gouged a deep wound in my leg. Screams, sounds of chair falling, child falling, and Mother running… all for a swipe of chocolate icing… However, there was one treat that was deemed by my mother—and apparently many other mothers—to be acceptable, perhaps, I used to think, because of its innocent name: the graham cracker. A cracker, after all, is not sweet. It was not expensive. It came in a practical red box with no pictures. It was easily doled out, for as every school child knows, omnia graham crackers in four parts divisa est. One cracker was the usual ration. I loved graham crackers, partly just because I was allowed to have them, but also because they had a certain friendly crispness, a melt-in-the-mouth texture with a bit of a tickle—probably the bran. You could make a graham cracker last. In a small hand, it was large and substantive. And it had those neat air holes. But, I grew up and put away childish things. I confess, I got into Pepsi at around age 12, and at 14, I started smoking, so that by the time I went to college, my usual breakfast was a ciggy, a Pepsi and, shudder, a Milky Way. My mother did not know of my vices (I am sure she suspected the smoking). I had gone way past the graham cracker in my search for taste sensations. So, it was a surprise, a pleasant one, to see, a couple years ago, in the local grocery store, a red, rather old-fashioned looking box on the shelf, announcing its contents as the “original” graham cracker. I had to try it, and honestly, I was not disappointed. By that stage of life I had long since quit smoking, and learned to hate all things corn syrup. The desire to remain reasonably slender and fit had militated against chocolate in most of its forms, and my hubby’s diabetes kept nearly all egregiously sweet stuff out of our larder. But…graham crackers. Surely an exception! These “originals” were satisfyingly sweet, made with sugar, a bit on the branny side, and in appearance exactly like the remembered childhood treat, complete with the mysterious little dots. Then, as chance would have it, not so long after reuniting with what seemed a rather harmless indulgence (I was calorie counting at the time and noting that one cracker was about 130 calories and still had the satiety value of the long-ago product), I read a book that would take me farther into the mysterious Secrets of the Graham Cracker: I found from Mr. Shprintzen’s book that Vegetarianism as a discipline arrived in America from England with our earliest settlers, and took hold among fundamentalist groups like the Bible Christian Church and later, the Seventh day Adventists. 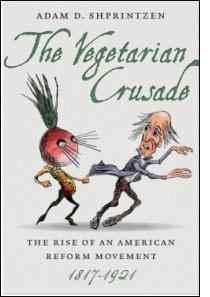 The American Vegetarian Society, modeled on an English one, was born in 1850 and was soon taken under a broad reformist umbrella, espoused by activists like Bronson Alcott (Louisa May’s dad), who established Fruitlands, his vision of a vego-topia. But it was the zealous, hellfire-preaching Sylvester Graham (1794-1851) who would pioneer the eponymous snack. In the early 1800s, Graham carved out a niche for himself by ranting against the evils of demon rum, in what was then the small, but quickly spreading, temperance movement. Graham, a thin-faced man and rather the model of the humorless Presbyterian minister with his starched collar and dour frown, soon focused his zeal on the realm of general health. It is known that Graham suffered from poor health, one reason why he took to the ministry rather than any more vigorous occupation. He had a lot of theories that we might today agree with, and others that, well… we might argue with. He believed, with some justification, that city-life was weakening Americans. In his day, before the era of suffragettes and flappers, he ministered to young men who had moved to the cities for income, who were losing the hand skills and healthy habits of farm life, who kept unnatural hours and did unnatural, repetitive labor, and who lived in crowded slums where the lifestyle was wide-open and the occasions for sin were many. Graham took his religion seriously, and saw sin under every blanket. He openly spoke against the wicked practice of masturbation (so shocking was this subject that women who attended his sermons and lectures were known to faint at its merest mention). Graham preached that this practice would lead to blindness (in case you ever wondered where THAT idea got started) and early death. (This may come under the category of theories we might argue with, as mentioned above.) He also believed in phrenology, the non-science that purported to be able to tell a person’s destiny and character by the size and contours of his skull. Graham’s published works include such enthralling titles as A Young Man’s Guide to Chastity and Discourses on a Sober and Temperate Life. However, his Treatise on Bread and Bread-Making was so radical that it once caused a riot among the bakers of Boston. One possible reason for their heat was his principle that all bread should be homemade, redolent of Mother and home. To help his followers combat any and all heinous personal habits, Graham started his own enclaves, boardinghouses for the Christian, the pure of mind and body. Grahamites were sworn to take only cold showers (hot water being deemed too exciting), sleep on hard mattresses with the windows open, evince cheerfulness at mealtimes, eat three meals a day with no snacks, and utterly spurn all tobacco, alcohol, coffee, tea—even cider. Since, at the time, even children generally drank some sort of grog and everyone loved tea, this was a very radical regimen. Grahamites ate a diet free of milk and meat (which could cause animalistic thoughts) making Graham an early voice for veganism; and they were to avoid refined foods, including white flour. The avoidance of white flour thus goes back a long way, though most of us first heard of it and thought it radical and cool in the late 1950s/early 1960s. Graham and his many successors in the health-food stream taught that refining flour, making it whiter and blander, also made it less healthy by removing the brown bits, i.e., the bran. I think if I could ask my readers right now how many agreed with this notion today, there would be 100% agreement. But in Graham’s day, these ideas were mocked in the mainstream. Grahamites were considered frail, fanatical, and funny. The counter to the rejection of white flour is that the whiter a substance is, the purer it is (the “dirt” has been removed). It was an idea that caught on quickly in the U.S. once it became known that brown or gram, or bran or graham, flour could be milled until the brown was gone. This concept also had a class element, as the wealthier could afford the flour that had been worked longer; dark bread became associated with immigrants and ignorance. Graham scorned these rising trends, and garnered numerous followers in his day. Grahamite boardinghouses were well known (if scoffed at) in large east-coast cities. 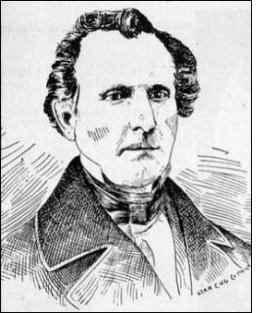 He sincerely wished to make his followers stronger and purer in all aspects of their lives, and to accomplish this, he aimed for what many homesteaders still seek: simplification, basics, natural solutions. He died at the age of 57, after helping to establish the American Vegetarian Society, and while trying to complete his magnum opus, The Philosophy of Sacred History, which he believed would vindicate his beliefs in healthy living by showing their basis in scripture. He was remembered by a few, for his contribution to the world of health food and vegetarianism, and especially his promotion of dark grains and whole bran that would influence a certain Mr. Kellogg. So, now that I knew that my cherished childhood snack had once been an ultra-radical health intervention with Presbyterian overtones, I came to suspect that perhaps my Presbyterian mother, 100 years after the demise of its creator, valued the graham cracker for its moral properties. I became determined to make my own graham crackers, and began looking high and low for a truly “original” recipe. I learned that the invention of the cracker even has a time and a place: 1829, in Bound Brook, New Jersey. No one disputes the identity of its inventor, but from there, the story gets a bit more, well, branny. What Sylvester created was actually bread, and therefore contained yeast. It wouldn’t have looked anything like the modern cracker, and it certainly would have been only nominally sweet, and that only because yeast requires sweetener to do its work. That sweetener, I reckoned, could have been honey or, more likely, molasses, the latter giving a dark color. 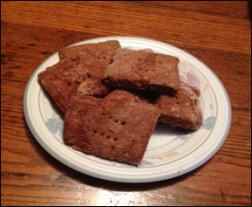 Still, I was determined to beat the box and make my own graham crackers, as authentically as possible. What I came up with was my own amalgam of several recipes I found online. I avoided fripperies such as cactus sugar and ground nuts, and as carefully avoided recipes that used milk and sugar, or even honey. For both, I substituted molasses. I bought my graham and unbleached flours at a local Amish grocery, and though I hesitated, I went with butter rather than margarine since Graham wouldn’t have had margarine and I felt butter would be slightly more acceptable to the proto-vegan than pork fat. Vanilla is a luxury of modernity but may have been part of the “original” recipe so I put in a teaspoonful, and I used such a light topping of cinnamon combined with so little sugar that the final result bears little flavor of either. I enjoyed making the “crackers.” I am sure that the resulting snack is no more expensive than store bought and a darn sight tastier. And since each one is plumper and doughier than a modern hard cracker, I feel that eating just one is only slightly more dangerous to the waistline than eating one entire modern slab… and a good deal more emotionally satisfying, harking back to Sylvester’s insight that home-baked goodies remind us of Mom and home. A little brown sugar, a little cinnamon for the tops, to taste. 1. 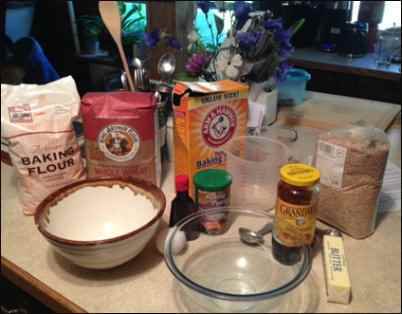 In a medium bowl, combine the flour, baking soda, baking powder, and salt. Add the butter and cut it into the flour mixture with a pastry cutter until the mixture resembles coarse meal. 2. In a small bowl, whisk together the molasses, vanilla, and egg. Add to the flour mixture and mix with a wooden spoon (or your hands) until the dough barely comes together. It will be soft and sticky. 3. Turn the dough out onto a lightly floured work surface and pat into a rectangle about 1 inch thick. Wrap in plastic and chill until firm, about 2 hours. 4. To make the topping, in a small bowl combine the sugar and cinnamon and set aside. 5. Sift an even layer of flour onto the work surface and roll the dough into a long rectangle about 1/8 inch thick. The dough will be sticky, so flour as necessary. Trim the edges and cut into individual rectangles (mine were about 3 x 4 inches). Gather the scraps together and use to make additional crackers (you may have to refrigerate for 15 minutes if the dough becomes too soft). Place the crackers on a baking sheet and lightly sprinkle with the topping. 6. Adjust the oven rack to the middle positions and preheat the oven to 350 degrees. 7. Using a toothpick or large fork, make two dotted rows in each cracker. I’m not sure if these serve any purpose but they look adorable! 8. Bake for 20 minutes, until browned and slightly firm to the touch. Let them cool and they will retain a bready texture with hardened edges. Time and practice will perfect these to your preference: if you like the bready texture, make the dough thicker and cook slightly longer. If thin and crisp is your desire, a flatter final roll out and 20 minutes should do the trick. I hope Sylvester will forgive me for snacking.